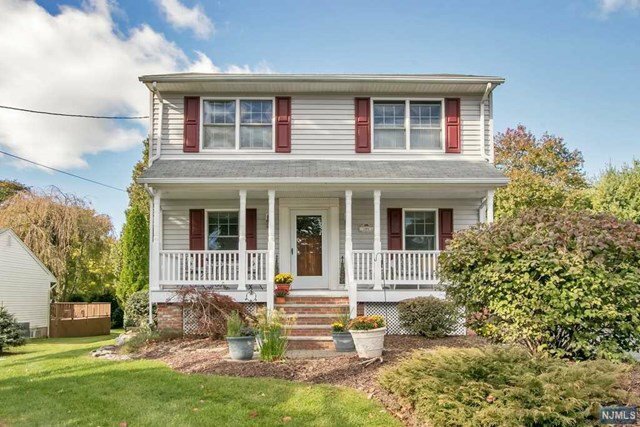 Beautifully Expanded Colonial, with lemonade front porch and so much curb appeal! Spacious floor plan with so many updates throughout. Large formal living room and dining room with gleaming hardwood floors. Bright and updated eat-in kitchen with wood cabinets open to expansive great room featuring vaulted ceilings, recessed lighting and wood-burning fireplace. Second level offers large master suite with updated full bath. Two additional spacious bedrooms and updated full bath complete second level. Lush, professionally landscaped property - close to shopping, schools and NYC transportation! Great schools! You will absolutely love living here! Listing courtesy of Coldwell Banker, Hillsdale. Selling Office: RE/MAX Elite Associates.